Occurring between 1950 – 1974 on Great Blasket Island and then later around the Dingle Peninsula, PrimAUDial Language Performances were always executed solo and unaccompanied by Róisín Madigan O’Reilly who is listed as their inventor and sole practitioner. 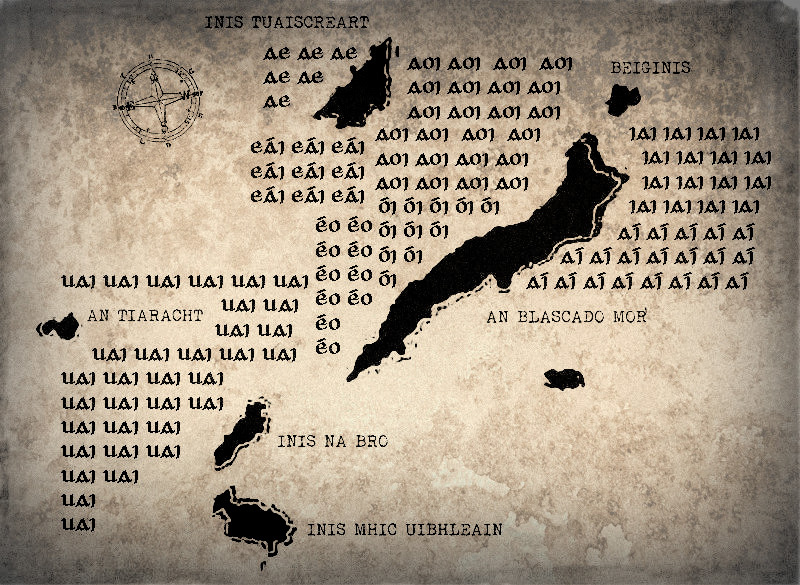 These happenings explored relationships between the vowel sounds of the Irish language and the sounds produced by natural forces in the landscape off and around the west coast of Ireland. Inherently ephemeral, very few traces of these happenings remain, although several documents exist detailing various stone/voice/sand PrimAUDial pieces. Works such as this are held in the private estate of Róisín Madigan O’Reilly. Deeply Nationalist in nature, PrimAUDial Language Performances built on the legacy of the Guinness Dadaists and sought to “weaponise” the Irish language and imbricate the sounds of the Irish language and the Irish landscape together into a singular mode of expression, so that “one is also forced to see that the word itself creates this landscape” (Perloff, M. and Dworkin, C. 2009). A notebook belonging to Róisín Madigan O’Reilly in the 1960s and held in her private estate documents her regular search for orifices and locations through which the wind blows. Such sites were always noted in the notebook with a long series of Irish vowel combinations, and it is not clear whether these are the vowels which were performed in PrimAUDial Language Performances or whether they constituted a form of sketch or preparatory work. Ford, F. (2014). Róisín Madigan O’Reilly. Historical Documents of the Irish Avant Garde. Walshe, J. (2012). A Brief Introduction to the Guinness Dadaists. Villa Elisabeth: Berlin. 13th September. This entry was posted in The West, Vocal, Women. Bookmark the permalink.